There are plenty of folks who will have been hurt by this crash. I was speaking with a Romanian entrepreneur about his friend who bought BTC on a credit card only to find that he is wildly underwater. The volatility is also frightening to folks who might have gotten in on the last run up only to find themselves back at the start. I pity the poor waiter who a friend saw making Bitcoin trades at $18,000 during his shift. I hope he sold. But there are no signs that the cryptocurrency train is stopping. Startups around the world are all examining – and doing – ICOs. Plenty of early crypto miners and buyers still have enough cash to play around in all sorts of ways. Bitcoin naysayers like R3 are figuring out that bankers didn’t want to hear “blockchain, not bitcoin” after all once they realized that bitcoin, like their beloved equities and commodities, was just another place for them to play. And people are still active in the market. That’s important. 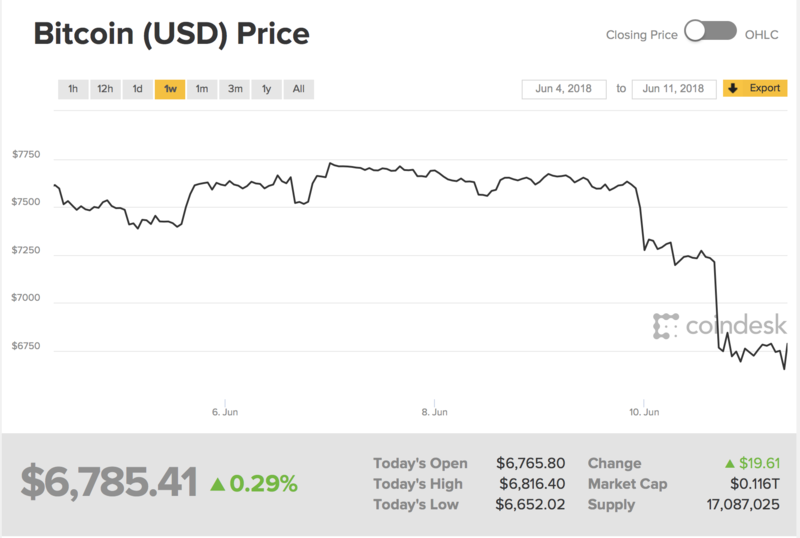 As this Coindesk analysis notes, the markets will be deeply volatile during this stretch and could remain so as risk-taking buyers snap up coin on the downswing. Don’t believe me? This is the seven-day trading volume for almost all of the exchanges. Ultimately these moves make up one of the most interesting forms of intergenerational and international wealth transfer we’ve ever seen. Whereas this wealth transfer once came in the form of inheritances and joint ventures, cryptocurrencies enable an almost instantaneous partners ship between the old and young and the near and far. It’s a fascinating economic time and I doubt it will let up any time soon. Sometimes the price goes up, sometimes it goes down. That’s the best advice any smart person can give anyone in any market. However, the signs point less to a flatline and more to a gut-wrenching EKG full of ups and downs. The patient, however, is not dead yet.